When we practice self-care, we teach our daughters to do the same. Our daughters are learning self-care by watching us. Historically, women’s needs have been suppressed and culturally, it was our role and responsibility to selflessly nurture those around us. This taught us to put others first and leave our needs for last. We, in essence, ignore what we need to help us live optimally. Therefore, it’s especially important that we model self-care for our daughters, so they don’t fall into the ways of the past. Being a mother to two beautiful children is my greatest accomplishment. Not my medical degree, or the awards I have won, or the business I started and a whole host of other accolades; but the fact that I breathed life into two amazing human beings who changed my life forever. They taught me what it means to love unconditionally, to protect someone at all costs, and to want more for someone than I wanted for myself. Having a daughter brought me joy and a sense of responsibility for raising a young lady who is confident, strong, caring and intelligent. A recent study from the University of Georgia found that, the mother-daughter relationship is the most important family dynamic that determines a girl's future relationship skills and self-esteem. When mothers are overly critical, their daughters are more likely to have poor social skills and unhealthy attitudes toward eating, compared with girls with more supportive moms. 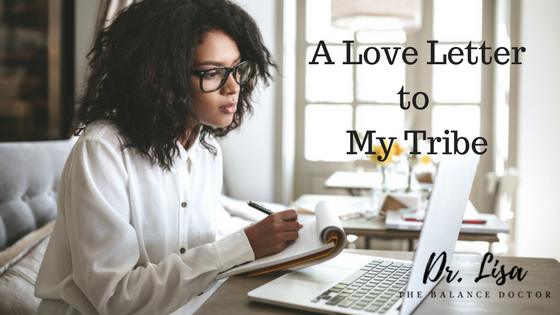 I wanted to be supportive and say all the right things that would provide her with the necessary tools to develop a strong sense of herself, to build healthy relationships with others and know the importance of self-care. I became aware that being a mom was not only about providing her with unconditional love, but also respecting her opinions, providing boundaries, communicating effectively and being open to change. I realized early on that my daughter was watching me. She observed the way I dressed, my mannerisms, the relationships I had with others, my own fears and anxiety. She watched how I cared for myself and how I allowed others to treat me. I wanted to make sure she was receiving positive messages, so I started to listen for the underlying meaning in our talks and learned the importance of being present. My daughter taught me the importance of self-care. My own exhaustion and burnout was recognized by her. She showed me that self-care is important by making me realize that I could not be fully present for her while I was drained and fatigued. She helped me find the balance I needed to be great mom, wife, and career woman. I began to take time out for me so that I could have the life I wanted for myself and for her. The practice of self-care and taking time to cater to your needs teaches others how to treat you. It shows them that you value taking time for yourself and also that they should respect your ‘me-time.’ Developing these habits for yourself and changing the narrative for how women should care for themselves and others, gives our daughters a solid foundation for adopting and practicing healthy habits. This in turn will lead to lower rates of stress, anxiety, health problems and strained relationships. It’s critical to develop a routine of self-care. Your self -care routine should be specific to your wants and needs. My practice includes meditation, prayer, walks, massages and reading. It includes preventive check-ups, volunteering in my community and spending time with family. My children, especially my daughter, remind me to have fun and to find that inner child who liked to be spontaneous, adventerous, and dance when there is no music—all things that made her feel joyous and free. I can’t tell you how to practice self-care, but it should include taking time to rest, exercise, eat healthy and have fun. In return, you will enhance your immune system, reduce stress, control your weight, increase your energy and improve your mood. Teaching our daughters these lessons early on allows them the opportunity to practice and develop healthy habits that will last forever. 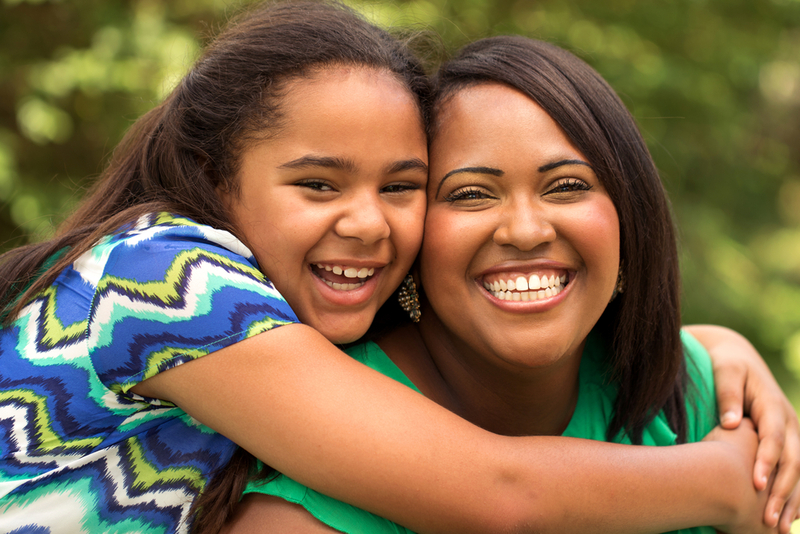 Ready to develop a self-care action plan and be a positive role model for your daughter? Register for my Signature Course, The Ultimate Roadmap To Finding Time For Yourself. The kick off for the course is July 23rd. The first 10 registrants will receive as a bonus, in addition to the online course, weekly live group coaching sessions with me. Find out more here. It’s self-love and it’s self-respect. It’s a commitment you make to yourself to take care of your mind, body and spirit. Self-care is as necessary as the air you breathe, so it’s essential that you reject the belief that taking time for yourself, equates practicing self-indulgence. Self-care is real, and it matters. Self-care is how you replenish all that you’ve given away and sacrificed. It’s the mindset, activities, practices and habits you embrace to guard yourself against stress, illness, depression, anxiety, and many more negative conditions. In the medical field it’s called practicing prevention. To care for yourself, you first have to know what you need and then go get it. Practicing self-care can not only change your life but it can save your life. So, what happens when you practice self-care? What would that look like? As with the scenario of a plane that has lost pressure, the right thing to do is to always help you first. Then, when you have your mask in place, you can assist others. The reason for this is simple. Until you are taken care of, you are likely to cause more problems and become part of the overall problem rather than being part of the solution. This is what self-care looks like. It’s about taking care of the things that matter to help heal you so that you can become part of the solution. So how do we get in the mindset of putting ourselves first and practicing self-care? 1. Boundaries: Understand what it means to create boundaries. We have all heard that we must learn to say no. And I truly believe that it’s crucial to be comfortable with saying no and knowing when to say it. But the truth is that most people get uneasy just thinking about having to tell someone no. So, the key is to not concentrate on the negative connotation that the word no may bring. Don’t dwell on the feeling that you are going to hurt someone’s feelings if you say no. You can approach saying no with the intention of honoring the request of the person by letting them know that you understand their needs and would be happy to help if another opportunity arises, but now is not a good time. No explanation needed. 2. Gratitude: Put self-care before your daily grind and wake up in the morning with gratitude. Practicing gratitude will get you in the mindset of what it means to take care of yourself. The fact that you wake up each morning and can live to see another day and be given another chance to make it better or make it right is the ultimate form of self-care. To continue the gratitude practice, you have to pour into yourself what your body needs in order to continue waking up each morning. 3. Self-love: This goes back to #1 because you must love yourself enough to set boundaries. You must cherish your time and energy. When you love yourself, you will do whatever it takes to protect your mental as well as your physical health. You know how important you are and what you’re worth. 4. A voice: A woman who puts herself first, is someone who has found her voice. She is able to know and verbalize her wants and needs. She does not let mommy guilt, wife guilt, or daughter guilt rule her decisions and she is unapologetic about taking time for herself. 5. A schedule: Learning to schedule your time and prioritizing is the ultimate form of self-care. It allows you to be able to make time in your schedule for you and the things you love to do. Being able to let go of things that don’t serve you will allow you to make time for the things that really matter. Self-care comes in many forms-physical, mental, spiritual and social. Developing a self-care plan that covers all these areas, that is easy to maintain and that gives you the results you need is important to your physical and mental wellbeing. Before you lose your way and continue to live in survival mode—before you get into the habit of not checking in with yourself—let’s make a commitment to plant the seed of a wholesome self-care routine. 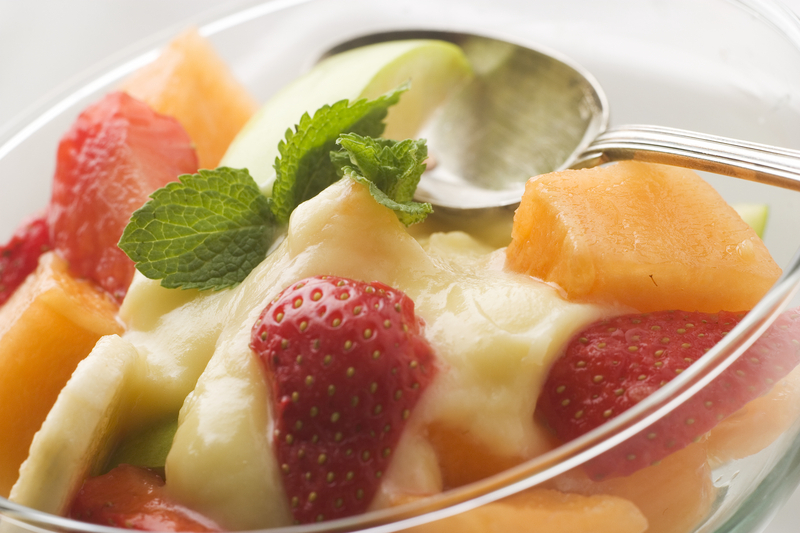 To stay in tip top shape during the summer, it’s important to eat healthy. Often, when we look for a snack on the go, it’s easier to pick unhealthy snacks like chips and cookies. Let’s face it, it’s easier, familiar and convenient, but there are several healthy alternatives that you can grab quickly and enjoy poolside, in the park or even pack for work. When grabbing healthy snacks try to aim for items under 200 calories. Veggies and Hummus-You can have as many veggies as you like. Think celery sticks, carrot sticks, broccoli, green peppers with about 3-4 tbsp of hummus. Apple slices and almond butter or nut butter- Apples are a great source of fiber. The almond or nut better provides protein and healthy fat to keep you feeling full. KIND Bars- Healthy, packaged snacks made with whole ingredients and under 200 calories. Popcorn- Popcorn that is air popped and eaten without butter or salt can serve as a healthy whole grain food that is low in calories and high in fiber. Greek yogurt- Greek yogurt contains protein that keeps you satisfied and it’s low in fat. For a crunchy effect add granola or whole grain cereal. Make sure your next grocery shopping trip includes buying some of the items above and then take the time to package them so it’s easy to grab and go. 2018 is here. Use this New Year to focus your attention on how you want your life to look moving forward. Are you going to keep telling yourself how hard it is to change your current situation? Are you going to continue to let fear hold you back from living your best life? Or are you ready to start a new chapter with positive change and a positive attitude? If you answered yes, here’s how. 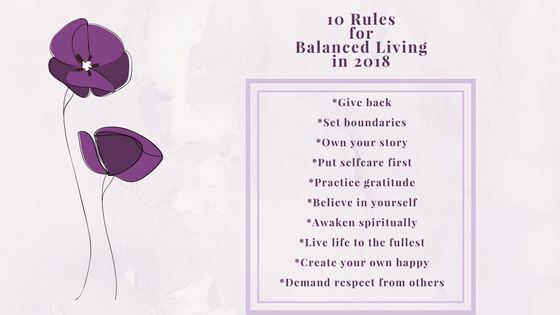 Below are my 10 rules for bringing in the New Year with balance and a new outlook on life. As women and mothers, you often try to please everyone and feel responsible for how others feel. Often times, this results in taking on more than you can handle. Learning to say no provides boundaries and reduces your chances of becoming overwhelmed and experiencing burnout. Learning to say no provides you with the extra time you need to recharge. Happiness has been defined as a state of well-being where your life is meaningful and satisfying. But everyone’s definition of happiness is different. It is an emotion that is brought on by a number of different scenarios and experiences. Creating your own definition of happiness, and not comparing it to others, can lead to your success and the achievement of your goals. Believing in yourself entails thinking positive thoughts about who you are as a person and what you can achieve. Positive words can improve your mood, increase your self-confidence, and help you get through a tough day. Developing a habit of feeding positive words or statements to yourself can boost your self-confidence in the long run. Reflect on your current situation. Do you find that you’re telling yourself the same stories? The same excuses? The same justifications? Every day you make choices about your personal life, career and relationships that are within your control. You choose whether you are going to wake up and exercise or sleep in. Whether you are going to surpass or simply meet expectations. Whether you are going to mend or surrender relationships. You choose if you are going to continue to define yourself based on past experiences. You can cultivate balance by changing your story and adopting the attitudes and choices that bring you peace. Practicing gratitude is a phenomenal way to continuously remind you of everything that you should be thankful for. It’s proven to lower stress, improve sleep, and boost your mood. Taking time each day to reflect on what you are grateful for will put life’s challenges in perspective. Not taking time to take care for yourself can easily lead to burnout. Making self-care your foremost task is important for balanced living. Decide what your “me-time” looks like and then pencil it in your schedule. Without this scheduled time, you can become disconnected and irritable. It has been shown that people who choose to live in the present and not dwell in the past lead happier lives. Enjoying the journey means embracing your successes and accomplishments and those of your loved ones. It means remaining optimistic. It also means taking one day at a time, instead of stressing over the future and what you cannot possibly foresee or have control over. It means not taking the little things for granted. You must be your own advocate for maintaining a healthy mind, body and spirit. No one is going to stand up for you, like you will. Love yourself first so you can know your worth and what you deserve. If you want to remain healthy and balanced, you must expect others to treat you with the respect and consideration you deserve. You must engage in difficult conversations when others continue to take you for granted. You must teach them how you need to be treated. Being in the presence of others who share the same mission can increase your sense of belonging as well as promote relationships, both personal and professional, that can last a lifetime. Giving back also gives you a sense of purpose and helps to develop a personal sense of accomplishment. This quote demonstrates how important being connected spiritually is to improve your quality of life. Spiritual beliefs and practices are how you can connect to others. It helps people to create positive feelings and a sense of inner peace. If you are a working mom looking for a work-life balance action plan for the New Year, my new soon to be released book Take Back Your Life: A Working Moms Guide to Work-Life Balance is the resource to have. To receive notification when the book is available sign up here. Wishing you prosperity in the New Year!